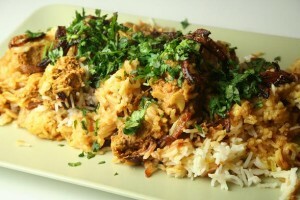 Lamb Biryani recipe by Nazia Nazar at PakiRecipes.com. In a medium bowl, combine the Yogurt with the Garlic , cayenne, Cumin, black Pepper , and teaspoon of the salt . Stir in the lamb. In a large saucepan, melt the Butter over moderate heat. Add the onion and cook until starting to soften, about 3 minutes. Stir in the cardamom , turmeric , Cloves, Cinnamon , rice, and the remaining 1 teaspoons salt . Cook, stirring, for 1 minute. Add the lamb mixture to the pan. Stir in the water and raisins . Bring to a simmer. Cover and simmer until the rice and lamb are almost done, about 20 minutes. Remove from the heat. Let stand, covered, until the rice and lamb are just done, about 5 minutes. Stir in the cashews.